EnaEna Jewellery - Do You Speak Gossip?Do You Speak Gossip? Good morning my dear readers! Today, I have a very special post for you. I know how much all girls love their jewellery, and I couldn’t pass the opportunity to talk to you about a new and amazing e-shop, I discovered. A few days ago, I had the chance to meet with its lovely owner, Katerina Chrysogeni, at her designing place, and talk to her about her love for handmade jewellery, her shop in Thessaloniki, and of course her newly created e-shop. After 5 years with her jewellery shop, Katerina decided to create ENAENA jewellery collection, based on semiprecious stones and fresh water pearls and sell them online on www.enaena.eu. I visited Katerina, at the place where she designs herself all jewellery for ENAENA, and I was very impressed both with her jewellery and the designing space. Everything is very well-made and tasteful and from the first look at her designs you can tell that she is a very talented designer. You can take a look at her e-shop, and find out for yourself. There are Stone series, and Fashion series, where you can find necklaces, bracelets and earrings, made with either leather or steel, with semiprecious stones or fresh water pearls. The e-shop ships worldwide and all items are handmade and unique but at the same time very affordable. I am in love with that four leather fastened bracelet with the large green stone. You know that green is one of my favorite colors, don’t you? And how about, those long earrings with colored jade stones? Quality is definitely not sacrificed over price, as all her jewellery is made One by One (as the name “EnaEna” means, in Greek). Minimal style at its best! I’m sure you’ll find something to love in her e-shop. I definitely recommend you pay it a visit. She’s in the process of creating her new fall/winter series, with colors and styles according to the season, so keep in mind to check her site again in the future. Visit EnaEna Jewellery on www.enaena.eu to find more amazing pieces of her jewellery collection and don’t forget to also like the store’s Facebook page. You can also find ENAENA jewellery at Fashion Jewels, at Metamorphoseos 4 in Kalamaria, Thessaloniki, phone number: +30 2310420832. She a lovely lady and I’m sure you will be impressed too, with her jewellery. This is a sponsored post, but all opinions are 100% mine. Nice choice! Glad you liked EnaEna Jewellery! Beautiful! Immediately I wanted to see some of her creations with pearls, I love pearls – and colorful stones too, you know! Some look like my neighbor’s creations, remember I talked about that? She has a shop too, and last week I bought some things there, thinking of my trip 🙂 It’s always good to discover new jewellery, of course! I’ll tell you a thing here, cause I admit I’m too lazy to write now… (how horrible is that! But you know me!) I thought of posting what I bought lately, but because there’s a friend who has a difficult financial time… and because of that tight-handed person you know… I decided not to post anything, cause that can generate quarrels… terrible! I really loved that she makes jewellery in an ecolgical way, so tasteful, so beautiful and I realy would love to wear some of her beautiful creations! Let’s see if she ships abroad! Thanks for showing the jewellery, very very beautiful! Denise recently posted..Brother, shoes, earrings and spray! You shouldn’t care about what other people say…It’s your money, and you can do whatever you want to do with it. Don’t let them control you and get you down. There’s no need. I’m really glad you liked the jewellery I showed you, because I saw them in real life, and they look fantastic. Of course they ship worldwide, so you can order them, wherever you are. Really cool. I love the emerald green!!! Beautiful jewels! I will dafinetely visit the site! So creative! Thank you! I’m glad you liked her jewellery..She’s very talented. oh, she is talented her pieces are wonderful. That is so nice that you made this post. I’m fine, thank you! Yes, she’s very talented and I’m glad you liked her pieces. I know you design your own jewellery, in a different style, and you can understand the work of the designer. Einai yperoxo na vlepeis Ellines dimiourgous me toso talento kai agapi se ayto pou kanoun! Oi dimiourgies einai monadikes! Kali epityxia sto e-shop eyxomai! Xairomai na anakaliptw Ellines sxediastes pou anaptisontai, kai stelnoun ta kosmimata tous kai sto exwteriko! Distixws poli ligoi to kanoun. claire d. t recently posted..The Versatile, sunshine and Kreativ Awards!! Thanks! I’m going to need all the luck that I can get for university haha. Aw, that’s so awesome that you had a group of 4 that stuck together throughout your entire university experience. Wow that is so cool that you actually got to meet the person who started up this online jewellery store. Their products look gorgeous. I can see from the pictures that a lot of detail and depth are in the stones used. And it’s great cause the prices are affordable! Woo. Beautiful jewelry! I really like the bracelet. I didn’t know her and just checked her e-shop! She is talented and her pieces have quality and are really affordable! Thank you all for your amazing comments! I’m glad you liked EnaEna Jewellery! Don’t forget to like them on Facebook and visit the e-shop to buy some of the beautiful, well-made, and affordable handmade jewellery of Katerina! Remember that the shop ships internationally. 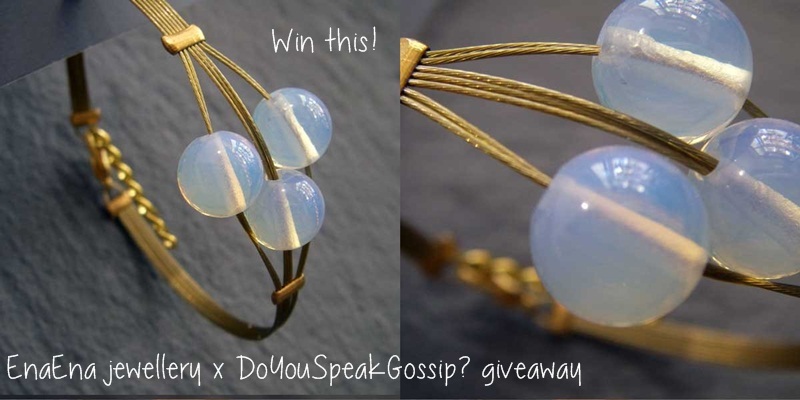 Pingback: EnaEna jewellery x DoYouSpeakGossip giveaway | Do You Speak Gossip?